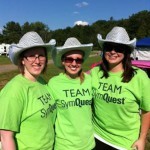 SymQuest Joins the Fight Against Cancer with the Relay for Life! Cancer takes far too much from far too many – something SymQuest employees know all too well. As a statewide Relay for Life sponsor for 4 years, SymQuest is proud to announce our participation in this summer’s overnight Relay for Life “Moving and Grooving” event as it spans 14 counties throughout Vermont. This year brings a special significance to our Relay for Life sponsorship this year. Brenda Broomfield, a valued and dedicated SymQuest employee for over 14 years, lost her life this past November to lymphoma. Chip Church, who has been with SymQuest for over 15 years, has a 16 year-old daughter who is currently fighting Leukemia. 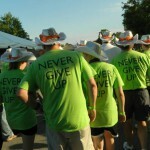 Every cancer represented in the Relay for Life has a specific color associated with it, so we will be wearing ours: green shirts for Brenda embroidered with “Never Give Up” and orange bandanas for Ashley. SymQuest is known for standing out at the Relay, so we will also be donning our fabulous lighted white cowboy hats with our shirts and bandanas! We’d tell you to look for us, but we’re pretty sure you’ll find us. Local support is crucial for any Relay for Life fundraiser, and SymQuest is proud to be a part of the multiple teams of friends, families, schools, businesses and organizations that are raising money for the American Cancer Society at this year’s Relay. How the Relay works is simple: the teams gather at a local track and take turns walking throughout the night. Teams setup camp sites and enjoy entertainment, activities and special ceremonies throughout the evening. Cancer survivors and caregivers are the guests of honor, and no Relay for Life begins without special recognition of them, followed by a beautiful and inspirational luminaria ceremony.